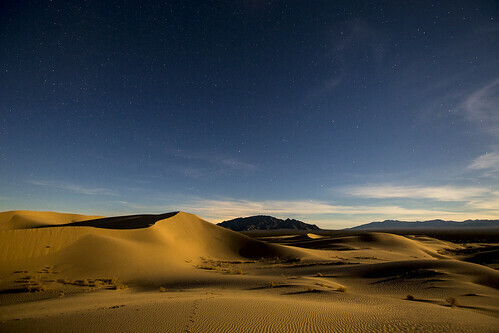 The Cadiz Dunes Wilderness is located in a remote corner of the Mojave Desert about 12 miles south of Cadiz and historic Route 66. The area is accessible year-round, but summer temperatures can soar to 120 degrees in the dunes so winter and spring are better times to visit. These small dunes were formed by north winds pushing sands off the Cadiz Dry Lake. The pristine nature of the dunes and the beautiful display of unique dune plants have made the area a favorite for photographers. It is surrounded by several other wilderness mountain ranges that provide dramatic backdrops for the dunes.